What th-- Hey, this isn't a collection! What's this doing in DC's collections section? Anyway, if you're still bent on getting all the 3-D covers (which, once they're second printing, I'm not sure the value, necessarily), here they are for a measly $200. I'd opt for the Villains Month Omnibus myself, in that case. Collects the "Absolute Power" storyline with art by Carlos Pacheco, "Vengeance" with art by Ed McGuiness, a one-shot Supergirl issue with art by Ian Churchill, all written by Jeph Loeb. This book also collects, for the first time, the issue #26 written by Loeb's late son Sam, with twenty-six different artists. This is called Batman and Son, but as a matter of fact, it's the paperback of the recent Black Glove Deluxe hardcover, collecting the contents of both the original Batman and Son and Black Glove collections. Possibly with recent Bat-events, DC thought "Batman and Son" was catchier for the paperback than "Black Glove." I wondered at one point whether this release was tied to a new Demon series, but I haven't heard anything about that. This collects the four-issue Matt Wagner miniseries that preceded the regular Demon series that ran almost 60 issues. Also included, Wagner's single issue of the series, #22. Maybe a collection of the Alan Grant or Garth Ennis Demon issues will follow. This third collection of Steve Englehart's early 1980s Green Lantern stories takes the book right through Crisis on Infinite Earths (and earns it a place on the DC Trade Paperback Timeline, once this collection comes out). The book Tales of the Green Lantern Corps Vol. 3 picks up where this book leaves off. Probably the most relevant aspect of this latest Man of Steel collection is that it looks at a relationship between Superman and Wonder Woman, though things go differently than they have in the New 52. There's also elements set up in this book that play out much later in the new Dark Knight Over Metropolis collection. The next collection or so would bring us real close to the "Supergirl Saga" that I've wanted to see collected for a long time; with Zod's renewed popularity, I'm hoping more Man of Steel collections are on the horizon (even a hardcover?). This collection wraps up the remaining uncollected Demon Knights issues -- Paul Cornell's #13-15, and then Robert Venditti's #16-23. Eleven issues is a lot for this collection. 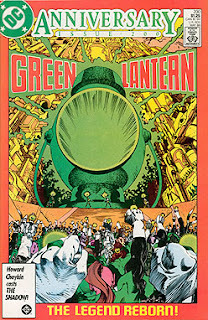 This crossover collection includes the final issues for all the Geoff Johns-era Green Lantern creative teams; all of these issues can also be found in the individual titles' Vol. 3 collections. Collects Katana #1-6 plus Justice League Dark #23,1: The Creeper, making this the earliest-published collection of a Villains Month issue. Interesting that the Katana villain was in the Justice League Dark issue; will we see further ties between these series? That's what I was thinking of buying this month. How about you? The Demon, Sector 2814 v3 & Man of Steel v8. That's all for me. Justice League Dark, Arkham Unhinged, Ex Machina, among what you mentioned. *Spider-Man by Roger Stern Omnibus--As I've mentioned before, this is some of the best Spidey material of all time. I have some of the old Marvel Visionaries trades so I probably won't get this to avoid doubling-up, but I hope we'll get a Stern Avengers omnibus if this does well (there's one of his WCA run, but I'm talking about the run which features "Under Siege"). *The Muppets Omnibus HC--For some reason, I can't get into seeing the Muppets in comic book form, but I hear that Langridge's work on the franchise is excellent. *X-Men: Battle of the Atom HC--I'm reading "Adjectiveless X-Men" month-to-month, and if the crossover interests me, I'll consider getting the other issues on Comixology and reading the whole thing. *X-Men: Days of Future Past HC--No surprise considering the movie is coming out soon. I give them credit for collecting a lot of British "Excalibur" material to flesh out the trade. If you're a Rachel Grey fan, this is a must-read. *Avengers Infinity Tie-In HCs: So far, "Avengers" has been essential for getting into "Infinity". I don't read "New Avengers" so unless the story demands that I go back and read it to really get something, I'll wait for this hardcover. *In general, most of the main NOW titles with hardcover first trades are getting their softcovers in December. I plan on reviewing a bunch of these in the next few months. *47 Ronin HC--I'm very interested to see Mike Richardson and Stan Sakai's take on this classic Japanese legend. "Usagi Yojimbo" is likely to make an appearance in my review queue one of these days. *Breath of Bones HC--I've been avoiding this... not for any doubts of the talent or the subject matter, but because I'm writing my own golem stories and I didn't want to accidentally steal anything from this book. *Transformers: Robots In Disguise Volume 5--Naturally. Volume 4 is getting a review in November, so this trade should be reviewed in February. I already per-ordered Spider-Man by Roger Stern Omnibus, X-Men: Battle of the Atom, X-Men: Days of Future Past, and Infinity Companion. Seems to be Marvel is taking all my money. Would you say that Spider-Man omnibus is good for someone like me who hasn't read much Spider-Man? Is it fairly stand alone throughout? I have read some classic collections of the earliest Amazing Spider-Man (and am pretty familiar with stuff through TV shows, movies, trading cards, etc throughout my life), but wondering if this book isn't heavily entrenched in some big continuity thing happening in the 80s? In any case I am excited to get it as a possible gateway into some Spidey comics! You should be fine. "Secret Wars" didn't start until about two years after most of the material in the omnibus was written, and that was the first real huge Marvel crossover. If you're going to whack a large dollop of cash on a big Spidey collection, then the Stern omnibus is the one to do it with. It works fine as s set of stories of a particular period that can be enjoyed by itself, though the Hobgoblin's introduction is the 'continutiy' glue that holds it together. The quality of the stories, though, is very high. As good as Spidey ever got, hecne the demand for this omnibus. I've got all the issues, but I'll be forking over for this again. Image solicits also includes Morning Glories volume 6. Morning Glories is a really fun, exciting and addictive comic. I'd love to see some talk of it on this blog sometime. It's basically like LOST, though it's a bit hard to process with all the gaps between the trades coming out, I always need to re-read stuff everytime. But it's a really cool story, with tons of mystery and time travel and religious allegory and etc. Recommended! Every time I flip through it, it seems like just a lot of schoolgirl cheesecake art, but Nick Spencer is a solid enough writer that I'll give it a shot at some point. I need to revisit Morning Glories at some point. I gave up around #15 or so, because it felt like it was all setup with no real resolution. I was lukewarm on Spencer at the time too. He has been firing on all cylinders lately, though - Bedlam is really good and Superior Foes of Spidey is the best new Marvel book of the year. He's also doing nice work on Secret Avengers. After so much conflicting information about its page count and contents, it's good that DC finally clarified that the Green Lantern: Wrath of the First Lantern HC will collect the whole crossover after all, and not just its first half. Still, completists are better off buying the third volumes of all Green Lantern series if they don't want to miss out on some #0 issues. About the Katana series, even though the Creeper one-shot is connected to it, they labeled it a Justice League Dark issue simply because that book sells much better. It's the same reason why China Miéville's final Dial H tale became Justice League #23.3: Dial E.
Stating the obvious, isn't that really confusing for the week-to-week casual comics fan? How is someone who's following the Katana series supposed to know that there's a tangentially-related issue coming out under the Justice League Dark banner? This is why I read collections -- they do all the work for you! Since the New 52 version of the Creeper was introduced in the pages of Katana, I guess the series' readers must have figured his one-shot would probably be connected to it, especially with Nocenti writing it, but the fact that the issue's cover didn't credit the creative team certainly didn't help. Interestingly, the "new edition" paperback of Batman and Son has been up on Amazon for about two months, still under The Black Glove.